I think this is turning into a week of cookbooks! There's this one today and another one tomorrow. Then, I'm not quite sure..maybe we'll take the holiday off. I know that I can't wait to see my boys' faces when they open the few presents that they're getting this year. Anyway...this post is about a cookbook, so on to the review! A Kitchen in France could almost be a coffee table book. It's filled with beautiful photos that were taken by the author's husband. The recipes are all straight forward and easy to follow. 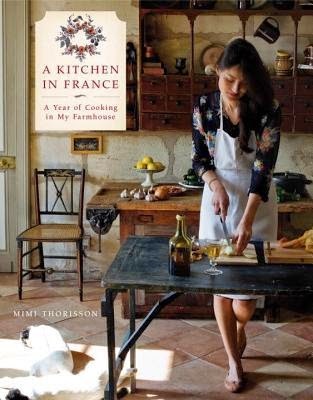 I was really concerned because I've heard that French cooking can be quite complicated, but I didn't find a single one that I couldn't pull off as a home cook. In a lot of ways, Mimi's storytelling gives you access to a part of life that few of us will ever get to experience. After all, how many of us have 7 children, a whole bunch of terriers and live in France? Not I and I for one, don't really want to. However, reading her stories about their lives made me smile and it encouraged me to find my own passions and to follow them instead of living in any sort of envy for what other people do or have in their lives.